Khajrana is a slum in Indore City with a population of 150000 people, which is increasing rapidly. Khajrana is one of the most challenging slums in issues like maternal and child health, sanitation, malnutrition, poverty and prevalence of common diseases. A majority of the residents are poor and unable to afford the basic necessities of life. Pahal Jan Sahyog Vikas Sansthan provides medical care to poor slum dwellers through their medical centre. These people do not have access to health care facilities, as there is no Government run centre nearby and private health care is unaffordable. •	The medical centre is open for all and provides free vaccination, health checkups, medicines and counseling to the local slum dwellers. 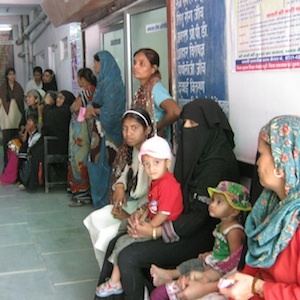 •	These services are provided with the support of VOLVO Employee Association (staff, infra structure and community awareness programs) and Pahal Jan Sahyog Vikas Sansthan (low cost medicine for fever & cough is provided). •	The NGO has acquired the premises on rent. •	Each patient is charged a minimal fee of Rs. 5/-. •	The staff includes,2 doctors, 1 nurse, 1 LT, 1 counselor, 1 clerk, 1 social worker, 1 maid and a sweeper. •	Cases with serious illness are referred to the Government hospital. •	The NGO currently provides its services to 30-40 patients everyday through the out- patient department. •	The centre runs 6 days a week from 9 a.m.- 4 p.m.
Jabir Ali is 52 years old, residing at Rajiv Nagar Slum at Khajrana Indore, working as a driver for his livelihood. Jabir reported at Kharana Hospital with the symptoms of continuous cough of more than two weeks and bleeding during the cough. Due to this he was unable to go on work, getting physically weaker day by day. During her visit at Khajrana Medical Centre Dr. Aradhana identified him as a TB suspect and sent his two samples of sputum to the Microscopic Designated Centre which runs under the Revised National Tuberculosis Control Program. After examination of sputum he was diagnosed with Tuberculosis. A worker of Pahal starts his DOTS and till date he is under observation of our field workers. Now Jabir is feeling well, has overcome from the problem of coughing & bleeding. He is back to his work and also gained some weight during the treatment. During his treatment he is come to aware that Tuberculosis is a treatable disease.